I thought it would be fun to look at the progress that has been made in my middle daughter Julie’s room over the past 18 months. Julie is 12 years old, and shared a room with one sister or another for 10 years. She was looking forward to moving into our new house for many reasons, but was probably most excited about finally getting her own room! One caveat - I had an amazing interior design team that worked on the decor of the main rooms of the house (and created a masterplan for furniture placement for the entire house, selected many of the finishes throughout the house, and determined the paint scheme for all interior rooms). However, Julie and I put together her room ourselves - both for budget reasons, and because I wanted her room to be fairly low key. We slowly but surely selected the items for her room based on what she liked and how she wanted her room to look. Here is a picture of Julie’s room after it was framed up. When we worked on the design of the house, we tried to create rooms that have ample natural light – with windows on two sides if at all possible. Julie’s room naturally worked well with this goal in mind. Julie’s room is directly over the library, and because of the ‘stacked’ design of the house (where rooms of equal size are placed over each other), it is the same dimension as the library, 14”x18”. It makes for a nice size room, with plenty of space for the queen bed that Julie wanted for her new space. Here is a picture of the room the day before we moved in. Julie had requested that her room look like a spa (despite the fact that she has a great love for vibrant patterns and colors – more on that in part II!). The guest room in my sister’s old house was painted in Donald Kaufman Number 29, a beautiful and versatile shade of green-blue, and this is what Julie wanted to use in her room. Because it is full pigment paint, it looks different throughout the day, and has actually ended up being surprisingly neutral because of its chameleon like ability to coordinate with so many different tones. I don’t think I took a picture of the room right after we moved in, but the room wasn't much to look at - Julie only had a mattress and a desk for several months. I am not sure if this is because we focused so much on the architecture and the main floor, or if it was because we were exhausted from all of the end of project expenses that naturally occur when building or decorating a house. Probably a combination of both. 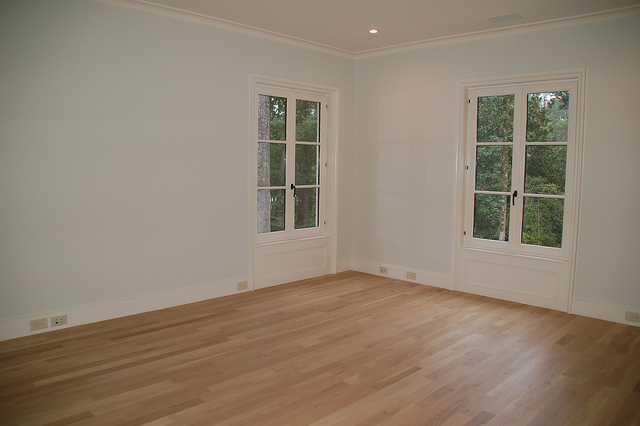 Here is the room after the basics had been selected. One of the first items to go in was the cream rug, which was a remnant purchased from Myer's Carpet back room. A rug was high priority - the plain wood floors made the room very cold and 'echoey' (is this a word?). I have to the trade access due to my art consulting and online store, so I was able to work with Douglass Workroom to fabricate the draperies, headboard, and bed skirt. I selected a basic Duralee linen in a pretty shade of green that worked well with the tones in the room. This green was also used as banding on the top of the curtains, which were fabricated with a nice heavy weight linen from Fabricut (which has since been discontinued). I ordered some simple painted wood rods, finials, brackets, and curtain rings off of Amazon (click on item to see on Amazon). The curtain installer cut the rods to fit the windows. I should probably paint them in Benjamin Moore white dove, which is the color of the trim. The bench, stool, and two side tables came from Chelsea Textiles. I was able to purchase many of the items when the Chelsea Textiles showroom in the Mart was moving, so I got them for a great price. The bench and stool have the signature Chelsea Textiles check on them, which worked fine for the room until we decided what direction to take the accent fabrics. When this picture was taken, I had not picked lamps yet for the bedside tables. I ended up using the lamps that were in my master bedroom in the old house, but they had not been put into place yet when I took this picture! Although Julie and I have slowly but surely made progress on the room, and it has become more comfortable and serene, Julie asked for a bit of pattern as the feel in the room was very neutral and plain. It was actually quite a challenge to work with Julie's two requests - a spa-like color scheme that also has some vibrant pops of color and lively pattern. It took me a long, long time to find a fabric that we both agreed upon, that had the right colors, and was youthful enough for a pre-teen room! But, I finally found some fabrics that work beautifully, and everything will be put in place next week. We had some pillows made, and the bench is being recovered. The fabrics are fun and vibrant and youthful, and provide the color and pattern that Julie wanted added to her room. I also just picked up the Louis XVI chair that Ballard Designs invited me to design as part of their ‘blogger challenge’. I asked Keith Arnold of Suzanne Kasler Interiors to guide the vision, as there were multiple ways in which the chair could be envisioned based on the new pillow and bench fabrics. I picked up the chair yesterday, and it is incredible!!!! When all is in place next week, I will take some pictures for part II of the post. On another note, many of you follow my blog by email subscription, which seems to be the most reliable way to get updates, as the subscription automatically emails any updates to the blog the morning after I post. Some of you follow by facebook. If you follow by facebook, and have not seen many posts from me, this is because facebook has changed their ‘fan pages’ to that only 15% of the people who ‘like’ my page get the updates at any given time. Facebook wants people with pages to pay to get their posts out to people, even if a person has ‘liked’ a page. 2) Go to the 'liked' button and hover your mouse over it. 3) In the pop-up select 'Add to interest lists'. That should do it! Interest lists are a new feature where similar facebook pages can be grouped – so, for example, I have an architecture and design interest list, and I can go click on it and see just the facebook posts from items I have grouped. But, apparently, by adding a fan page to your interest lists, you can also make sure that all of the posts will show up in your news feed. If anyone knows more about this, please let us know! I tried to post this on facebook, but it only went out to 5% of the readers – they have tight control over fan pages at Facebook these days! Thank you for 'liking' Things That Inspire! Small art, perfect for special, one of a kind holiday gifts or hostess gifts! Can't wait to see the full reveal of the room and what fabrics you chose. Great job so far! It already looks amazing. I can't wait to see the finished product! Very cool to get a view of the same room in framed state, in empty but finished state, and in furnished state. I am looking forward to seeing the next layer. I think a series of three pictures over the bed, or maybe a starburst mirror, would be pretty. Beautiful soft colors. For an adult, I would carry on with the soft colors and have some gently patterned pillows and such - a la Phoebe Howard style. For a 12 year old, I would do as you have done, and go with something more lively. Can't wait to see what you have come up with. Have a nice weekend. We have the room wired for overhead lighting or a fan, but wanted to see whether the room ended up needing a fan or a light fixture before deciding. The room definitely does not need a fan, but it doesn't need the extra lighting of a fixture either! Although my architect and designer do not love can lights, we decide to put in four small cans in the corner of the room. With the cans, and the lamps, there is ample light - so it is really a question of aesthetics. I have identified several light fixtures that I think would work well in the room. Loved this post, Holly! You have such a great eye and such a great way of describing in detail the process of putting together a house! I love everything the two of you have done in Julie's room! She is a very lucky girl and I know ya'll are enjoying this process! Can't wait to see the next installment! Thanks for sharing this! Wish I could hire you to help me do some things over in my own house! I love your taste! It looks wonderful Holly, I can't wait to see the house! Hope you are enjoying the holidays! Holly I am so happy that you and Julie worked on her room together! very excited to see the new changes! Beautiful room. Love the color palette and the size of the room. She is one lucky girl. Cant wait to see the full reveal. Your daughter's room is beautiful. It's youthful without feeling too childish. I am a big fan of Chelsea Textiles Swedish pieces. Their finishes and proportions are lovely. I'm looking forward to Part II! Your daughter must be so happy with her new room. Looking forward to part 2 and seeing the chair you designed! Beautiful so far! She is very lucky! Can you share the fabric name and color that you used for the headboard? Thanks! I will have to go to FB and check out all of this silliness. I have your post emailed to me so I won't miss any! Hi Holly, You did an absolutely beautiful job. I love the color palette and the furnishing are perfection. (Did you use some Chelsea Textiles pieces? )What a lucky girl! I love the richness of Donald Kaufman paints. It's all in those pigments. I love that it's a room your daughter can grow into -no hot pink walls and barbie doll sheets! Very pretty Holly...love the colors, the vibe and the overall feeling. She is a lucky girl! look forward to part II! I love Chelsea textiles..have a few things from them too. Hope alls well....happy holidays! Beautiful feminine room. You are lucky to have such a big space. Cant wait for part 2 ! I can't wait to see what you finally decided on Holly! I know Julie will love her finished room! that just stinks about Facebook trying to bank on followers. I follow you by email and so enjoy your blog. You did a beautiful job on your daughters room. I love the look at the end! You and your daughter are two patient people! Two weeks would have been too long for me; and our daughters! I am in the business......so........understandable! It looks wonderful!! Why do you think it took you and her so long? (meant in a total " curiosity and learning" way! ) !!! Most people want results quickly after remodeling! Remodeling is disruptive and stressful! Were you both afraid of making a mistake? I am trying to wrap my mind around a "year"!! The only thing I can think of after my 40 year career; is "fear"! Nothing wrong with that; I am just genuinely curious. And you don't have to post this!